Developer Quote: "Pocket Scanner-Documents on the go gives you the flexibility to make quick scans and share whatever you capture with others." The ability to scan documents using your iPhone is really a break-through productivity feature that will save time and mailing costs in preparing and sending out necessary information to business associates. 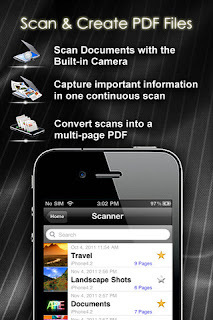 Pocket Scanner-Documents on the go is a wonderful utility that produces stunning quality PDF files by scanning a large assortment of documents, modifying them as needed, organizing them, then exporting these items in PDF format in order to share them. You can also view documents in a wide range of formats which simplifies your life even further! Quickly scan a variety of items such as business cards, whiteboards, newspaper articles, recipes, restaurant menus, class handouts, or lecture slides. Additionally, images can be imported from your photo library. Take advantage of the built-in image processor to optimize the quality of your scan by cropping, rotating, and adjusting its exposure, B&W option, and edge detection. Arrange and sort scanned images and documents into multiple folders and customizable scanner projects. Enjoy an easy-to-use interface for you to copy, paste, cut, delete, and rename files. Scans saved within the same scanner project can be shared and exported as a single PDF document. With the powerful PDF reader engine, easily open large and password protected PDF files, add bookmarks or use text search to quickly navigate to the right page. Conveniently transfer your scans via e-mail, WiFi, USB connection, and various cloud storage services. Many superb options included multiple documents in one scan (also known as continuous scanning), realistic quality of scanned images, text search, awesome image filters, and project settings to produce an official presentation including title, layout, margin, page number etc. These are invaluable, time and money saving features that can serve you well in both a personal and professional capacity. Open your app to 4 major options of: Scanner, Docs, Settings and Help. Why not view Help first to get a feel for the app even though the interface is quite intuitive to navigate? Here you will find helpful information on: What is New in the current version, Scanner Features, Viewing Files, File Management and Transferring Files among other options. Now you're ready to begin. Tap Scanner and then Add to either Scan, Preview, Make PDF, Clean (Delete) or access Settings. I scanned a restaurant menu which was placed under the PDF Documents tab. I then used features such as Crop, AF (Auto Fix), Adjust (flipping/rotating) to make my scan perfect. 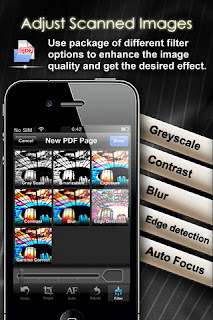 Choose from many Filters including Gray Scale, Exposure, Contrast, Blur, Edge Detection and Gamma Correct. Some cool things you can also do with your PDF doc is to utilize Text Reflow (makes reading so easy), Text Search, Air Print (so handy), Lock Rotation and Email. By tapping your Docs button, you may choose to share your information by WifFi, use Browser or iCloud services (Box.net, iDisk, Dropbox, GoogleDocs or FTP), Download or add a new folder to start organizing your documents. Don't forget there are tons of useful Settings such as Show Private Folder, Viewer Mode, Air Play, WiFi password protection, etc. 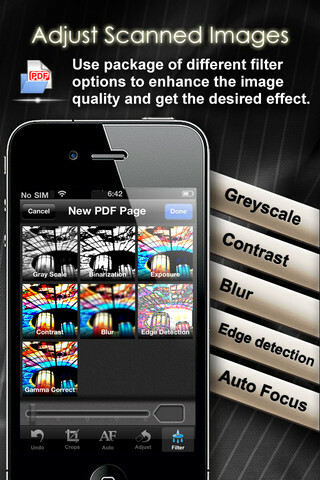 which will provide full utilization of all the content Pocket Scanner has to provide! 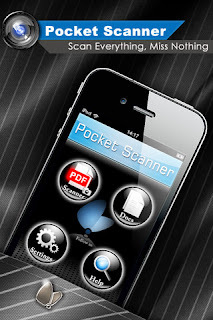 Pocket Scanner is loaded with useful and neat features at an affordable price that makes it so easy to create and share PDF documents with just a few taps. COOL CONCLUSION: Pocket Scanner - Documents on the go allows you to organize and make excellent digital PDF documents of items you need to share with business or personal acquaintances, saving money and time without losing the quality of original documents." --Developer: Kdan Mobile Software Ltd.